Life is nothing if it’s not uncertain. Yesterday morning four young teens loaded into a car without a care. Through a tragic accident, three of these young people and a fourth and older driver lost their lives. The death of young people is so unexpected and tragic. 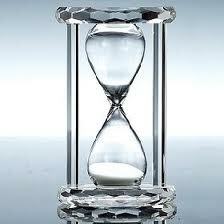 We envision that the hour glass of their lives is so top heavy with hours, days, and years yet to come. It’s times like this that we realize how important it is to talk about the salvation of Jesus – for this life, and for eternal life. I don’t know the relationships these children and young man had with Christ, but I pray they are with Christ today. As we get older, we find it harder to change who we are and follow Christ. Our hearts harden like clay laid in the sun. Temptations enter our lives, peer pressure increases, obligations begin to rule our time, and our road in life is set on a course that seems unchangeable. But with Christ – life is easier. And even though it may be harder to turn from what you have accepted as your life, His offer still stands: “Come to Me, all you who labor and are heavy laden, and I will give you rest. Take My yoke upon you and learn from Me, for I am gentle and lowly in heart, and you will find rest for your souls.” (Matthew 11:28-29) Salvation is not only an offer of eternal life, which is invaluable in and of itself. It is also an offer for peace in this life, rest for the soul. In Matthew 20 Jesus tells the parable of a man who owns a vineyard. He goes to the marketplace at the beginning of the day and hires people to work in his vineyard, and tells them they will earn a denarius (coin) for the day. Then he goes back in the third hour and hires more, and again in the sixth and the ninth hour. Even in the eleventh hour, near the end of the day, he finds those who are still standing idle with nothing to do, and he hires them and says to them, as to the others of their wages, ‘whatever is right you will receive’. The vineyard represents life, and the owner represents Christ. The wages are eternal life. Jesus says “for many are called, but few chosen”. Has Jesus gone to the marketplace searching for you? Has He asked you to be His? If He is calling you, if you feel the desire in your heart to follow Him, now is the time to do so. None of us have a timeline of our lives to see if we are at the beginning or the eleventh hour. Life is uncertain. The time to trust Jesus for salvation is NOW. Attaining salvation is not difficult. It is a matter of Faith in Jesus Christ. If you believe that Jesus is God’s Son, that He died on the cross for your sins, to justify all your wrongs, you qualify. Ask God to save you. It’s a simple prayer from the heart, a conversation with God. Allow Him to enter your life and take your heavy burdens from your heart. Do it now, while He waits, while sand still falls in the hourglass of your life. If you find it hard to believe in who Jesus is, search it out. Seek to find the answers you need to have faith in who He is. There are many, including me, who will help you find those answers, and help you develop the faith to believe for salvation.